Dr. Frederick Ramsay has quite an interesting background. He taught anatomy at medical school. He was a clergyman. Now, he is a writer, with a series of books featuring Sheriff Ike Schwartz, a standalone novel about Judas Iscariot, and, his most recent book, Predators, a mystery about Botswana. Ramsay started his program at the Velma Teague Library by showing a map of Botswana, a country the size of France, with a population similar to metropolitan Phoenix, 1.8 million. It's a landlocked country in southern Africa. When it received its independence in the 1960s, it had no capital. The capital of South Africa was also Botswana's capital. But, the President, who was married to a white woman, could not go to the capital of his own country in South Africa. Dr. Ramsay said there is a terrific book called The Color Bar about the history of Botswana, and the change from a protectorate to independence. There are game parks everywhere. The ordinary people do support the game parks. Most people live in clusters around towns. Seventy percent of the country is covered by the Kalahari Desert. He went on to show us a book, saying this is Botswana. It's a country with beautiful modern buildings, and cattle grazing in front of them. It's a country of contrast, trying to be in the modern world. For instance, there are no telephone lines in the country. They have cell phone towers, and everyone in the country has cell phones. You might see a person riding a donkey, talking on a cell phone. 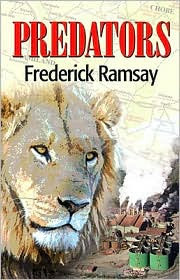 Predators, Frederick Ramsay's latest book, was written as a standalone. But, he's working on a sequel, because his editor wanted one. His son, who is Communications Coordinator for the Government of Botswana, will be his co-author for the second book. The featured character in Predators is a lion, Sekoa, whose name means invalid, because he's sick. In the next book, the lead character will be a gorilla, but there are no gorillas in Botswana, so the story will have to cross the border. In this one, the other main character is a man named Leo Painter. Leo is rich and famous, the head of a large corporation, but he's had two heart attacks, and there are those who want to take him down. Sekoa and Leo are the predators. Sekoa is challenged by a younger lion, just as Leo is challenged. There isn't a lot of difference between the two predators. Sekoa has the feline version of AIDS, along with pneumonia. Sekoa, the real lion in the book crosses paths with Leo,the hypothetical lion, just as there are real hyenas, and hypothetical hyenas in the story. The hyenas are waiting to eat Sekoa when he dies, and the human hyenas are after Leo. There's a grey monkey in the book, who causes a great deal of trouble, and a woman who does the same. Brenda is a former exotic dancer who snagged Bobby Griswold. Brenda is a naughty woman, and Bobby thinks it would be best if Leo dies. He needs money to keep Brenda. According to Ramsay, it was a challenge to write Brenda because she has a potty mouth, but he doesn't write that kind of language. He had to insinuate she was using the language, without actually writing it. So, the narrator will tell about the effect of her words on others. She does get her comeuppance. There is a clash of greedy people in this country that is proud of being the least corrupt country in Africa. Two characters are contrasted - the old, white, male, rich man, and a young, black, poor female, Sanderson. She is a game warden. Both of them have sons dying of AIDS. The real predator is AIDS because it cuts across everything. Ramsay said he's capturing present-day Botswana. It's not Alexander McCall Smith's country. That's a description of 1985, a country that no longer exists. The people like Alexander McCall Smith for bringing attention to the country. But, Ramsay said he thinks of him as a Joel Chandler Harris. His stories feature stereotypes, just as Uncle Remus was one. Botswana is now a modern country with a booming economy. The book takes place in the north, in the Chobe region of Botswana. The countries were told they couldn't change borders when they got their independence, so even if tribes were cut in two, the borders remained the same. There is an character in the early part of the book from Zimbabwe. Botswana has a problem with illegals, and crime. They are often people from Zimbabwe who slip across the border, and resort to petty theft in order to eat. There are problems with Zimbabwe, but as long as "Crazy Bob," Robert Mugabe, is President, it won't get better. Ramsay said as Communications Coordinator, his son, Jeff, is also press secretary for the President. Jeff is married, and has three children, so Ramsay usually has to go to Botswana if he wants to see his son. Botswana sees the U.S. as a friend, and admires us as the most productive country per capita in the world. They have gone from being tribes people in villages, to a protectorate, to an independent country. So, they have to learn to run a country. They have to be shown, this is how you run a library. The economy there is fueled by diamonds. Botswana owns 10% of De Beers. They want to bring in industry, including cars. There is a large collection of Japanese cars. It seems as if everyone if Japan turns in their car every three years. So, there is a surplus of right hand drive cars that can only go to British countries or former protectorates. Predators is actually Frederick Ramsay's love song to Botswana. He loves the country. It has a climate like Arizona's. It's a high desert. Think of Arizona if it had elephants and lions. Ramsay loves the people, and their spirit. Seventeen percent of the people are affected by AIDS. Everyone in the country knows someone with it, or someone who died. They are attacking it head-on. There are billboards, condoms on the counters in stores. Motels provide them at bedside. The current President of Botswana is the son of the former one. He was the former head of the army. The current President is a conservationist who is trying to reintroduce rhinos. You can't hunt in Botswana. There are game trucks to take people to see lions, elephants, and hippos. But, the animals are dangerous. Hippos are the chief source of homicides in the country. In Predators, there is a corollary between animals and humans. If you strip everything away, we're not that far away from the animals. Ramsay recently did a book signing with Betty Webb, author of Desert Lost. Her book is about young males who have been dumped from religious sects in northern Arizona and Utah. It's not that different from the lion in Predators. Lions force young males out of the pride, and when a new lion takes over, the cubs are killed. Tourism is important to Botswana, but, they want eco-tourism. They don't want to be an amusement park for the world. In fact, they were upset with Greenpeace trying to talk them into taking down fences, and wanting the tribes and cattle to be able to wander. They didn't want Greenpeace trying to tell them what to do. They want to be a modern country. Throughout the talk, Dr. Ramsay allowed the audience to ask questions. In response to one question, he said the literacy rate is high. People can read and write, but they read newspapers, not books. There are ten newspapers in the capital of Gaborone. His son told him Predators won't do well in Botswana since the people don't read books. When asked how his son ended up in Botswana, he said when he was in high school in northern Virginia, he had a friend from northern Rhodesia, who invited him to visit him and his family. Jeff went, and fell in love with the continent. When he went to college, he thought he'd be an Arabic scholar and a lawyer. But, he quickly discovered how difficult Arabic was. So he took African subjects, and history. He moved to Botswana, and stayed. According to Dr. Ramsay, there is a very stable government in Botswana. The President can serve for two five-year terms. It's a parliamentary republic, but the President's terms do not overlap Parliament's terms. The people elect representatives to Parliament, then the Majority elects the President, who chooses the Vice-President. The President cannot be from Parliament. And, there are four appointed seats, not elected ones, because the Cabinet needs a different skill set than the members of Parliament. It's a system of checks and balances, and it's very stable. The British told them they could become their own country, but warned them against it. The people were dirt poor, and Botswana was the poorest nation in Africa. They got their independence, and then found diamonds. They are building a first-rate country. The buildings in the Capital are forty-five years old, or newer. Ramsay's next book will be about a mineral called coltan. Coltan is used in electronics, such as cell phones. Eighty percent of coltan is found in Congo, and that's what the conflict in Congo is about. The world is turning a blind eye because they need coltan for electronics. That's the subject of the book. And, here's a tip about it. Coltan and mountain gorillas are found in the same area. In response to a question, Ramsay said he wrote his first book a long time ago, and it was terrible. His wife knew a person who knew a person, who had a connection, so Ramsay suddenly had a Hollywood agent. And, he kept offering him books, that weren't the action books he wanted. He went to some workshops, and rewrote that first book, Artscape, the first in the Ike Schwartz series. It sold to Poisoned Pen Press. Ramsay has another book in that series coming out in July, The Eye of the Virgin, about a Russian icon. He was asked about his book, Judas: The Gospel of Betrayal. He replied that he never liked that whole the devil made him do it angle of Judas' story. That angle didn't work for him. Judas was trusted with the money, and, he was the one disciple Jesus called friend. John's gospel is hard on Judas. But, read Acts, and see what Peter says. He didn't condemn Judas. wrote a story he thought was plausible. When asked about research, he said some of his books are researched, and some are made up. He has an art thief disable alarms in Artscape, and he's been asked about his research. He didn't do any. He created a system, and then he disabled it. But, he did research Judas. He's been to the Holy Land six times. He took courses, and studied scripture. Where his story intersects scripture, he used Luke's Gospel. He made Judas the advance man who handled the money, and made dinner and room arrangements. He presents his take on Mary Magdalene and Thomas. He was asked why he didn't publish with the book with a religious publisher, but he said he wasn't conservative enough for Zondervan, and he's too conservative for other publishers. Ramsay was asked about the difference in writing women characters, and he said he writes them carefully. He finds it presumptuous to write women. But, his books have been well-reviewed for his treatment of them. The female in the Ike Schwartz series, Ruth Harris, has a PhD, and is president of a women's college. Her banter with Ike makes her work. But, Ramsay doesn't do a lot of description of his characters. Readers know the characters by what they say. People know what they say or do. He doesn't describe them visually. He said he's from the radio generation in which listeners made up what the characters looked like. He said you can tell the age of a writer by their character description. If a character looks in a mirror for a description, the author is from the TV generation. The final question dealt with the sequel to Predators. He said it was meant to be a standalone, but Barbara Peters at Poisoned Pen Press is his editor, and she tells him what to do, and he does it. The sequel will be called Reapers, about the harvesting of coltan. The World Cup will be the background, bringing in celebrities and money. It was a successful afternoon, when an Arizona author could bring Botswana to the audience for Authors @ The Teague. Predators by Frederick Ramsay. Poisoned Pen Press, ©2009. ISBN 9781590586846 (hardcover), 251p. My sister in law lives with her husband in Kenya, so the African setting would be interesting to me. I also thought the red-haired Judas was interesting...I didn't realize that there was no knowledge of an Iscariot. Considering Dr. Ramsay's familiarity with Botswana, I'm sure the setting is accurate, Elizabeth. 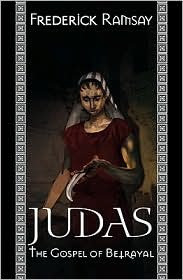 And, I was fascinated by his premise for Judas, since he was an Episcopalian priest. Lesa, thanks for sharing this. I was quite interested in all of it. We have some good friends who lived in Africa for many years, in fact, the husband grew up in Zimbabwe or Rhodesia as it was then. They have a son who is moving to Angola soon. Anyway, I was fascinated. I haven't read any of Dr. Ramsay's books, but I will put him on my list. Sounds like another book to purchase while I'm in Arizona next month. Isn't it nice to get a chance to visit the Poisoned Pen, and stock up, Kay? You can tell how much Dr. Ramsay loves Botswana. His son sure made a convert! Just a quote, Clea. Dr. Ramsay referred to it as homicide. I'd think of it as accidental death, but I'm not in the mind of a hippo. Now, I don't know about hippos, Clea, but I can see a cat doing it intentionally.